Learn how to enter the relaxed and peaceful state described as ‘just being’ in the present moment. Includes short mindfulness exercises to incorporate into your day-to-day to help you manage stress and feel more at one with yourself. Three soothing and reassuring guided meditations teach you how to just be in the simple ‘here and now’. Includes mindfulness, breath awareness, acceptance, self-compassion and relaxation techniques. Giving yourself permission to be in the ‘here and now’ without trying to achieve anything or go anywhere naturally quietens the ‘racing mind’, releases physical stress and promotes inner peace. 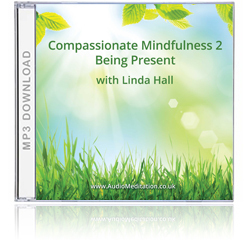 ‘Being Present’ is the second in the series – Compassionate Mindfulness: a collection of deeply relaxing guided meditations, combined with simple everyday exercises. Showing how living mindfully and with self-compassion acts as a powerful antidote to modern day stress, and supports health and wellbeing. 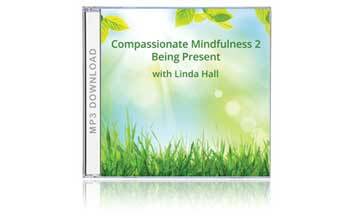 This album focuses on how to gain peace of mind by just being in the simple ‘here and now’ around you. When we are hijacked by our busy minds, most of our waking hours are spent thinking about the future or the past. Our thoughts directly affect our current physical and psychological state. Stressful thoughts directly give rise to physical and emotional imbalances which impact on our long-term health and well-being. Learning to give ourselves ‘time out’ in the simple ‘here and now’ is a really effective way of soothing the mind and calming the nervous system. Neuroscience shows that when we come away from the part of our brain that deals with thinking, and focus on our senses instead, the body’s natural relaxation response is triggered so that equilibrium can be restored. ‘Being Present’ shows you how to use your breath, attention and attitude to sit back and rest in the simple sensations of the ‘here and now’. Each meditation track on this album is followed by a short track suggesting how to easily incorporate what the meditation has taught you into your everyday life. *These meditations are taken from ‘Conscious Process’, a twelve-week programme to support health.